Eumundi State School wins $250,000 for outdoor ‘open air’ classroom, which will include a kitchen and expanding their edible gardens. The Slow Food Kitchen Garden/ Edible School Gardens are expansive to say the least around Eumundi State School and the quest for edible food has been driven for over a decade by many passionate class teachers especially Jon Gemmel who’s vision is to also have an outdoor kitchen and an abundance on food throughout the whole school and a showcase of sustainable systems. At the entrance of Eumundi State School you are greeted by 6 raised garden beds which are home to 8 productive citrus trees . You walk from the admin building towards the prep classrooms passing 3 boxed vegetable gardens then arrive at 6 tank garden beds which are currently growing potatoes, pineapples, celery, asian greens, parsley, kale, snow peas, beans, lettuce to name a few. We walk past the tuckshop/canteen (check to see if the tuckshop needs anything from the garden), to the other end of the school to find a hidden vegetable garden. These are the small gardens, you are about to be blown away by the next figures. 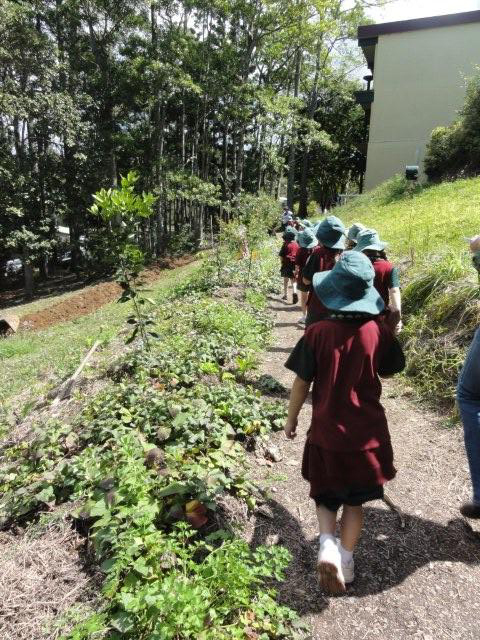 We walk down the hill, here we have *Swaled veggie patch – 6 swales of 16m each and swaled food forest – 100m2 on contour with another 18 fruit trees of mixed varieties of it such as custard apples, avocado, jacoticaba, grumichana, orange, mandarins, lemonaide with understory of sweet potato, herbs, pigeon pea, dog bane etc. On the newer swale we have a green manure crop growing to build up the soil fertility, they have cowpea, alfafa and buckwheat seed sown into them. The seed had an inoculants added to them before sowing to increase the fixing of nitrogen into the soil. But there is still more. Further along from these swales are the original gardens planted more than 15 years ago – this school is well ahead of their time, I remember when I first started Edible School Gardens 10 years ago people could see no reason for growing your own food and that it was even a sign that you couldn’t afford to buy food!!! Thankfully that attitude has been composted. Here we have a Mandela garden, approx 25m2, with compost systems, banana trees, more fruit trees and an incredible worm system. There are 8 x 500 litre compost worm bins with approx (at last count!) 5000 worms per bin having a feast and turning compostable waste into a valuable resource, thanks to the Eumundi Markets across the road that service the worm bins and bring the scraps, approx 2 full wheel barrows , over to the school and place them in the bins. We guess that equals about 100+ kilos of casting – bring on that worm poo that is so nutritious for our edible plants. Each bin also has 60 litre capacity of worm liquid ‘gold’. Each term new classes come into the garden and learn all the processes involved with edible school gardens – there are classes on a waiting list to get into the garden, coz as we garden teachers have always know – the kids absolute love gardening, eating fresh food straight from the garden, and the teachers enjoy learning all the processes and eating the fresh produce too. 3. Salad of Lettuce, fennel, parsley, dried dates, sunflower seeds and Haloumi. Oranges would be nice with this - if anyone has any that would be great - otherwise I'll buy a few. During other garden classes our students invent their own recipes and how attitudes to food have changed, over the last 10 years while I have been running the edible school garden program students have allowed their taste buds to experience so many new flavours. Look at this winning salad created by year 2 students and eaten and given the ok by the rest of the class. *Swale is used to capture and control water, they are dug out on contour of the land, the soil mounded up on the lower side. They are used to stop water from simply flowing straight down a slope and away from your property. The idea is that the water has more time to sip into the ground , giving plants more access to water.